Is there money to be made making web animations? We all know that the people at the very top of the game are making enough money to pay high price call girls $2000 an hour JUST to drive them around in their limousines, but what about the rest of us? How many of you do this for a full time living, part time to supplement a “day job”, for occasional chump change, or simply as a hobby? I fall in the “occasional chump change” category. Nothing I do is commissioned. I make animations and videos, post them on certain sites that pay a royalty, and then three to six months later I get a check or a PayPal payment for two or three hundred bucks (minus those PayPal fees). I think of it as supporting my habit. I guess it’s not bad. I could be spending a crap load more on golf clubs and golf course fees every year. Plus, creating web content means I get to be around my kids more often than if I golfed. My kids love helping out with voice acting or suggesting silly jokes for use in my videos. What avenues are there? Mobile content. 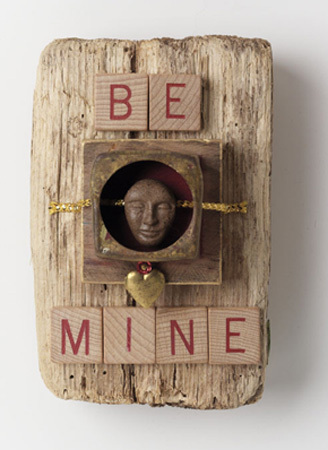 Online greeting cards. AtomFilms. Anything else out there I should look at. Animator Ross Bollinger stopped by on Friday for the first time and showed us his film “The Mosquito Who Gave Up Blood.” Nice to meet you Ross. Come back soon. 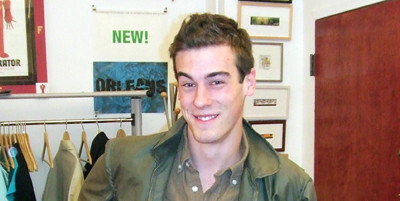 We met Elliot through his membership on Channel Frederator RAW late last year. We featured his cartoons in Episodes 86 & 106 and in our & “48 Frames…” contest, we’ve hung out at the New York Drinking and Drawing’s, and he gave us a nice, thoughtful, Christmas present. Thanks to Elliot for kind permission to post some of his storyboard. 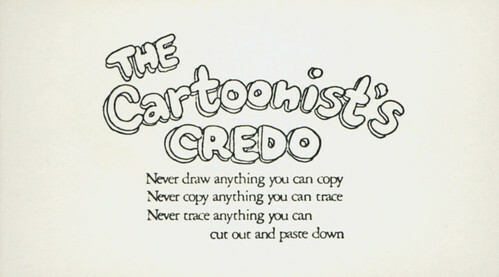 Leave it to idea man/writer/comedian David Burd to perfectly rewrite Wally Wood’s “Cartoonist’s Credo” for the modern world the same day I posted it. 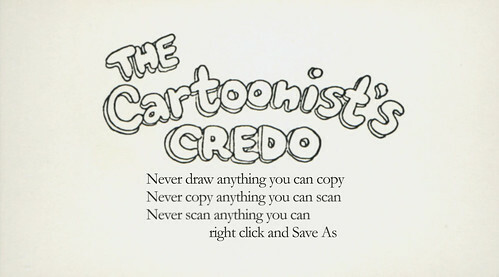 For reasons I can’t remember, during a conversation the other day with Dan Meth I mentioned a card my old friend idea man/writer/comedian David Burd used to hand out (when he was working on MTV networks IDs for us in the 80s) called “The Cartoonist’s Credo.” I couldn’t remember the exact wording but it seemed applicable to our conversation. I emailed David and he wanted me to make sure to give credit where credit is due to the originator, Mad’s Wally Wood, and that I should link to www.impko.com. And he sent me a pile of the cards too! Thanks David. There’s always someone who blows up the conventional wisdom and then the world is never the same. 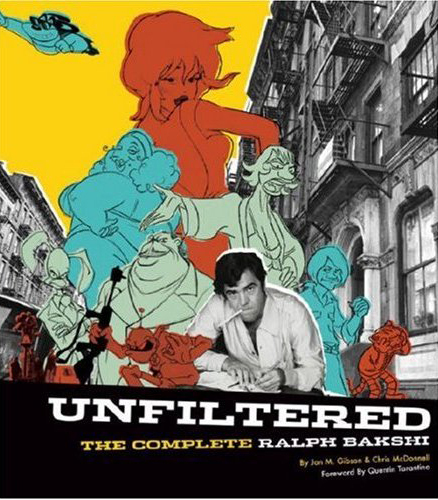 Ralph Bakshi is the one in animation, and we can all thank him every day. I should add I was thrilled Jon & Chris mentioned the couple of shorts of we did with Ralph in the 90s at Hanna-Barbera. It was an honor he chose to work with our then experimental program (I guess it’s in keeping with the man) and helped introduce our wacky idea to the world. Thanks Ralph. Scott Nash has been one of my great friends and closest colleagues for over 25 years, though I don’t think we’ve actually done anything together for at least 15. He not only illustrates and writes books, consults on graphic design, teaches, and produces animation and movies, Scott (and Tom Corey) designed the Nickelodeon logo for my agency. Scott stopped by with Nancy and Dave to catch up and fill us in on his animated project The Uh-Ohs. Scott’s been hiding his wife from me for 25 years, so I was thrilled to finally meet the talented Nancy Gibson-Nash, a collage artist. She’s quite lovely, so of course Scott kept her out of sight. Dave Schlafman is an independent filmmaker designing and directing a great project with Scott, The Uh-Ohs, and he dropped in on Eric at Frederator/West a couple of weeks ago. Dave was working at Soup 2 Nuts when he and Scott met. Here’s the original ’shooting’ storyboard for Adventure Time, a cartoon short made for Nickelodeon’s Random! 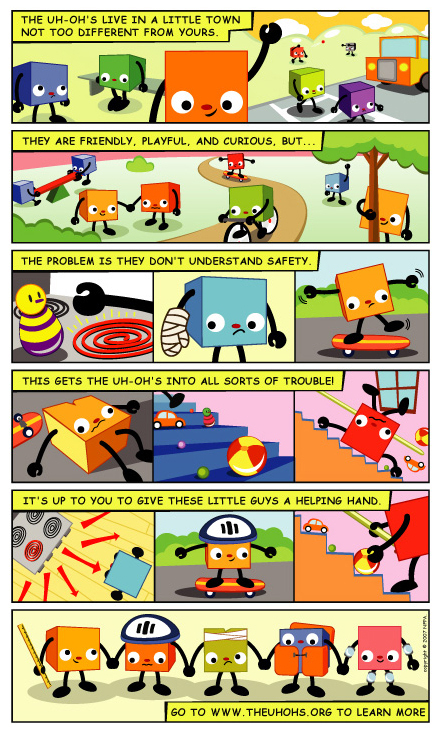 Cartoons that has exploded as an internet phenomenon, with over 1,000,000 views to date. It’s incredible to see how intact Pen Ward’s vision was from the very beginning of the project. Writing about filmmaker Marv Newland several times over the past year got us in phone touch for the first time in the 21st Century and spawned a few joint projects I’ll be telling you about sometime. The first is a short film*, Marv’s (and Frederator’s) natural medium. Over the past six months or so Marv’s been sending us from his trips around the world (the one above’s from Hollywood). And in addition to the obvious –our New York address– there’s a cartoon embedded on the left, animated to a hot 1920’s Joe Venuti soundtrack. *Update: Marv’s film is now officially titled “Postalolio” and will be featured in international film festivals throughout 2009; I’ll post the schedule as it becomes booked. Kevin Lofton, Jackie ‘The Joke Man’ Martling, Rohit Sang, Lynn Shaw. We had a full house in New York last week when one of our favorite directors, Kevin Lofton, was in with Jackie “The Joke Man” Martling, and partners Rohit Sang and Lynn Shaw. Many of you know Jackie from his stint on the Howard Stern FM radio show and are familiar with his adult comedy act. But, we discussed the team’s idea for an animated kids show. Thanks for coming in folks. See you soon. 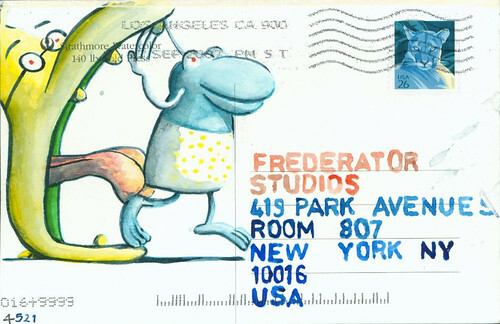 Get the latest Frederator news! ChalkZone, The Fairly Oddparents, Fanboy & Chum Chum, Nickelodeon, My Life as a Teenage Robot, Oh Yeah! Cartoons, Random! Cartoons, and all associated graphics © 1998-2008, Viacom Intl. All Rights Reserved. Adventure Time, and all associated graphics © 2009 Cartoon Network. A Time Warner Company. All Rights Reserved. Channel Frederator © 2008, Next New Networks, Inc. All rights reserved. 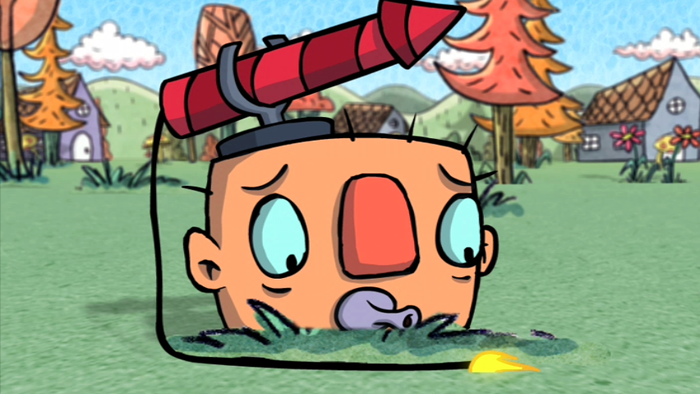 Frederator Studios © 2005-2008, JoeJack, Inc., All rights reserved.